Wing span: 1 1/2 - 2 1/4 inches (3.9 - 5.7 cm). Identification: Upperside is dark red-orange, borders darker; hindwing with yellow submarginal spots. Underside is gray-brown; outer half much lighter, frosted white or silver-gray. Silver spot at center of hindwing is fishhook-shaped. Life history: In the afternoons, males perch on plants in valley bottoms to seek females. Eggs are laid on petioles and undersides of host plant leaves. Caterpillars eat leaves and rest underneath. Adults hibernate. Flight: Overwintered adults emerge and lay eggs in the spring until June; the new generation appears in July and flies until September, then hibernates. Caterpillar hosts: Currants and gooseberries (Ribes), western azalea (Rhododendron occidentale), and mock azalea (Menziesia glabella). Adult food: Sap and nectar from flowers of sweet everlasting (Gnaphalium) among others. Habitat: From foothills to treeline: forest openings and edges, woodland streamsides, brushlands. Range: Boreal North America south of the tundra. Central Alaska south to central California and northern New Mexico; east across southern Canada and the Great Lakes region to New England and the Maritimes. 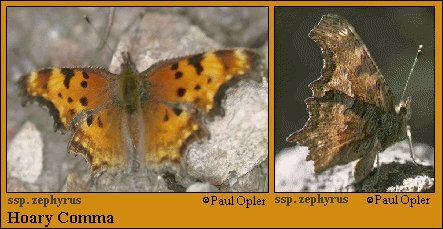 Note:The Zephyr, subspecies zephyrus, was previously treated as a separate subspecies.